Christmas and the holidays are quickly approaching... so it's time to start checking some people off your gift list and what could be better than a holiday DVD! If you have a special little girl in your life between the ages of 2 and 8 years old then this would make the perfect holiday gift! 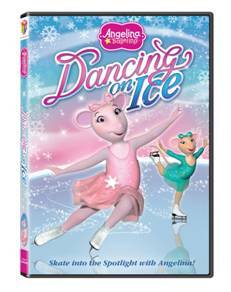 Angelina Ballerina will be dancing her way into the hearts of little girls this holiday season with Angelina Ballerina: Dancing on Ice. She quickly danced her way into the heart of my 7 1/2 year old daughter. My daughter started dance classes when she was just 2 years old. After watching this movie she told me that now she wants to be an ice skater and start taking lessons.